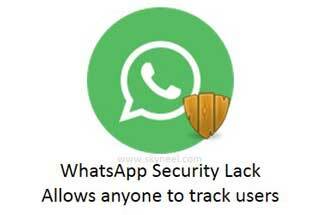 There are billion of users are daily using his WhatsApp account, but sometime WhatsApp security lack allow anyone to track users. Due to that anyone can watch your WhatsApp detail and track your location. You know very well about the WhatsApp feature which is used by billions of persons daily on his Smartphone to send or receive any text, audio or video messages. It’s is top instant messaging app which users increase day to day. But at present time lot of people arise a question is anyone break WhatsApp security and track information of any registered user. Maikel Zweerink, student of Dutch University develop a web-tool Whatsspy which can be used to track any registered WhatsApp user. This app is developed by Maikel Zweerink only to show how much your data is secure on when anyone using WhatsApp facility on his smartphone. If anyone attach with WhatsApp facility then this program track user profile picture, privacy setting, status when any user online or offline but it must be noted that this software work only when you set your privacy on “Nobody” on WhatsApp. If you want to lock WhatsApp messages then you need a third party app. You can easily download free “WhatsApp Lock” app from Google Play store. If you want to download this app on your smartphone then you have to search this app on Google. This App available in blackberry users also. After installing this app you will be able to lock all running applications except this application by adding any password. If you want to unlock any application then you have to give password again. You can also lock access of your profile picture in WhatsApp. For this first you have to go WhatsApp Settings > Click on the Privacy Settings > Now, Click on the Contacts Only option. Now, your profile picture will be locked for another users. Lot of time WhatsApp server send any mail or voice message on your id in which is ask to change profile photo, video, or change payment mode. There is no need to click on these type of sms, because they will be scams. When you are using WhatsApp on any public place, cyber chafe or office always remember that you must need to logout after using WhatsApp application and delete your computer browsing history also from your phone or system. I hope you like this article; keep safe your personal and confidential information with others by taking few important steps which is mention in this article. Thanks to all.